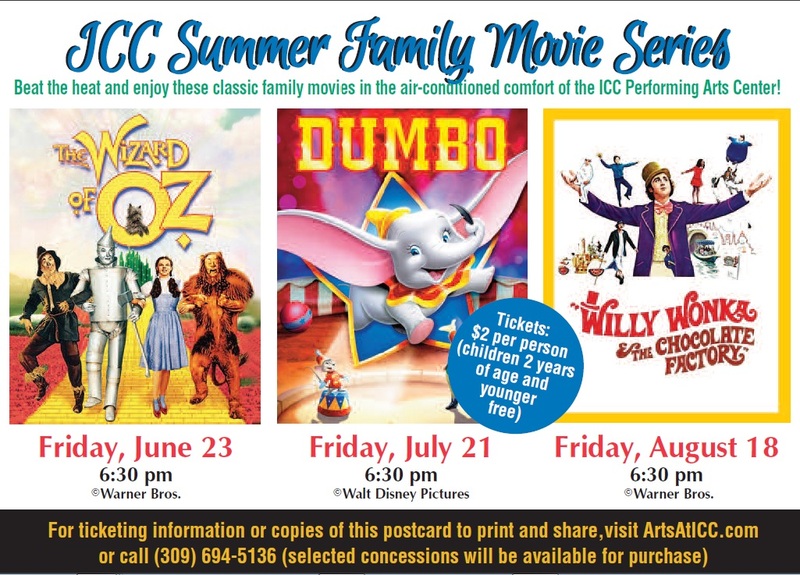 The ICC Performing Arts Center presents the classic movie The Wizard of Oz on Friday, June 23 at 6:30 pm. Tickets cost $2 per person. Admission is free for children 2 years of age or younger. Selected concessions will be available for purchase at the event. The event will be the first of three summer family movie nights offered. Disney’s Dumbo will be shown July 21, and the classic Willy Wonka & the Chocolate Factory starring Gene Wilder will be shown August 18. All movies will be presented in the air-conditioned comfort of the ICC Performing Arts Center, located on the East Peoria Campus. The Wizard of Oz is based on the 1900 novel The Wonderful Wizard of Oz by L. Frank Baum. The movie was released in 1939 and stars Judy Garland as Dorothy along with Ray Bolger, Jack Haley, Bert Lahr, Frank Morgan, Billie Burke, and Margaret Hamilton. It was nominated for six Academy Awards, winning for Best Original Song with "Over the Rainbow" and Best Original Score by Herbert Stothart. It was also nominated for Best Picture but lost to Gone with the Wind. The story and characters also served as the basis for Wicked, the Tony-award winning Broadway musical told from the perspective of the witches in Oz. The family movie event is offered by the ICC Arts & Communication Department. The Arts at ICC has a rich history of enhancing the arts community and expanding education beyond the classroom. Arts at ICC presents more than 500 exhibits, performances, lectures, rehearsals, meetings, master classes, clinics, seminars, receptions, orientations, forums, auditions and tournaments annually. For tickets or more information, visit the Shows & Tickets area of ArtsAtICC.com or call the ICC Performing Arts Center Box Office at (309) 694-5136.